EB Games weekly flyer January 19 - 25, 2018 - Far Cry 5 - with EB Exclusive Bonus Model #: 731838 $79.99 Sale Price Pre-Order Far Cry 5 at EB Games and receive an Exclusive Whistling Beaver Beer Mug! 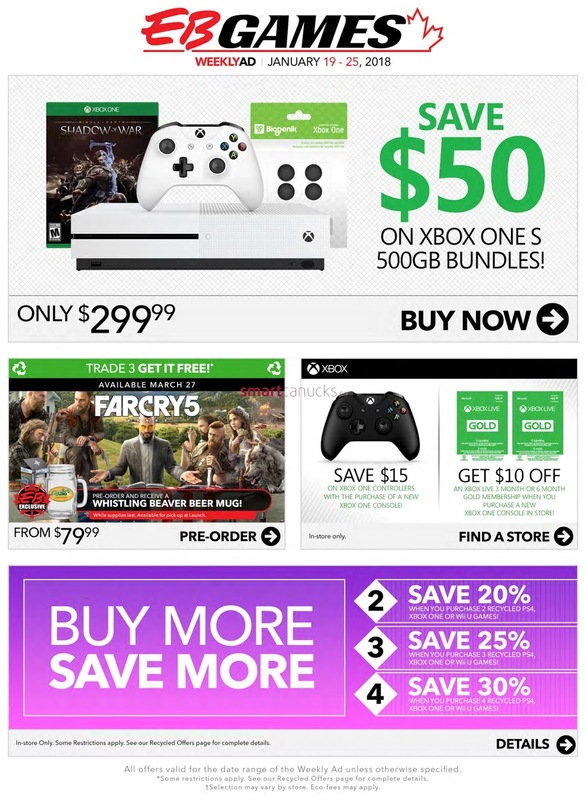 Xbox One S 500GB Bundles Model #: 734071 $299.99 Sale Price $50.00 Savings. 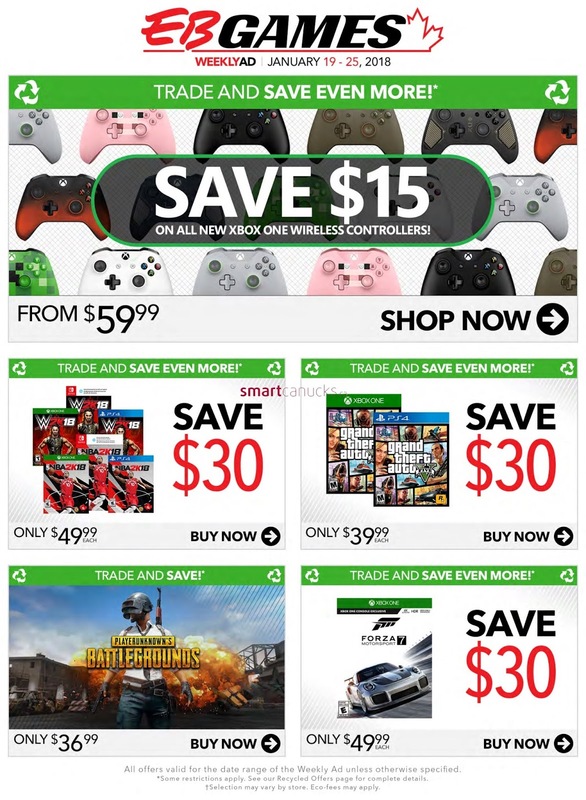 Xbox Live 3 or 6 Month Gold Membership $10.00 Savings. EB Games weekly flyer NBA 2K18 Model #: 729418 $49.99 Sale Price $30.00 Savings The future of sports career modes has arrived, allowing you to play the game the way you like. Build your career in NBA games, hit the courts in The Playground Park, join the Pro-Am circuit, or explore the shops and venues in an all-new open neighborhood setting. Featuring new MyPLAYER upgrade and endorsement systems, our biggest cast of characters to date including NBA players, and so much more. All New Xbox One Wireless Controllers $59.99 Sale Price $15.00 Savings. Grand Theft Auto V Model #: 716647 $39.99 Sale Price $30.00 Savings When a young street hustler, a retired bank robber and a terrifying psychopath find themselves entangled with some of the most frightening and deranged elements of the criminal underworld, the U.S. government and the entertainment industry, they must pull off a series of dangerous heists to survive in a ruthless city in which they can trust nobody, least of all each other.